New! Updated to allow for in vitro transcription. This PCR Cloning Kit contains an optimized Cloning Mix containing a proprietary ligation enhancer and a linearized vector that uses a novel mechanism for background colony suppression to give a low background. It allows simple and quick cloning of any PCR amplicon, whether the amplification reactions are performed with proofreading DNA polymerases, such as Q5® which produce blunt ends; or nonproofreading DNA polymerases, such as Taq or Taq mixes (OneTaq®, LongAmp® Taq) which produce single base overhangs. This is possible due to “invisible” end polishing components in the master mix that are active during the ligation step only if needed. The kit also allows direct cloning from amplification reactions without purification, and works well whether or not the primers used in the PCR possess 5´-phosphate groups. The ultimate in flexibility: clone with any amplicon made with any DNA polymerase, with or without 5´ phosphates, purified or not! A 500 bp PCR product incubated with the linearized vector in a 3:1 ratio according to recommended protocol. 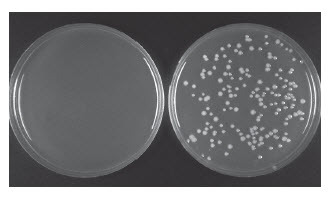 2 μl of reaction was transformed into provided NEB 10-beta Competent E. coli and 1/20th of the outgrowth was plated. Left plate serves as the control, with vector backbone only, right plate contains PCR insert. The NEB PCR Cloning Kit contains a sufficient supply of materials to perform 20 x 10 μl cloning reactions. Primers are also provided, allowing screening for inserts by colony PCR and/or sequencing. Wang, Y. et al. (2004). Nucleic Acids Research. 32, 1197-1207. Heurgue-Hamard, V. et al. (2000). The EMBO Journal. 19, 2701-2709. Tenson, T. et al. (1999). Journal of Bacteriology. 181, 1617-1622. 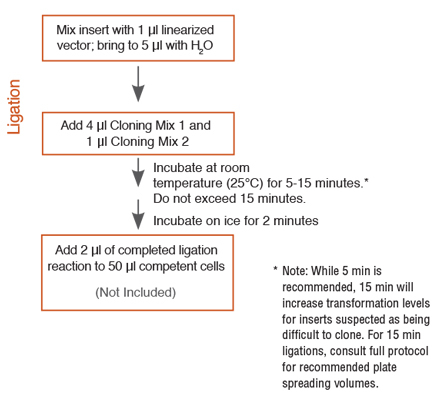 How does the NEB® PCR Cloning Kit work? How can the cloning vector work with both blunt-ended amplicons and single-base overhang-containing amplicons? Do these polishing components present in the master mix affect my cloning efficiency if my insert already has blunt ends? Do my inserts have to possess 5´ phosphates? Can the cloning kit be used for inserts that are not necessarily PCR amplicons? Can the cloning kit be used with inserts containing 5´ or 3´ overhangs greater than the single-base overhang achieved by PCR with Taq DNA polymerase? Can I use the NEB PCR Cloning Kit featuring pMiniT 2.0 for Golden Gate Assembly? Does the PCR product need to be purified? Can I use a different competent E. coli strain than the provided NEB 10-beta strain? How can I maximize the number of transformants? Can I scale down the reactions to use less vector? Are there limits regarding the size of inserts that can be cloned? Are the NEB 10-beta Competent E. coli (Cloning Efficiency) provided in the kit the same cells as NEB 10-beta Competent E. coli (High Efficiency)? How can I determine if my NEB 10-beta cells are competent? Can Cloning Mix 1 and Cloning Mix 2 be mixed together before adding them to the ligation reaction? Where are the +1 transcription positions for the SP6 and T7 promoters for in vitro transcription and translation located? What is the difference between the original pMiniT and the pMiniT 2.0 linearized vector backbone now provided in the kit?